The figures are staggering. A whopping 80 per cent of the world's population has suffered from back pain at some point in their lives, says Dr Jeffrey Katz, associate professor of medicine and orthopedic surgery at Harvard Medical School, in his book Heal Your Aching Back. In an office setting of 100 people, he estimates, on a given day, about 10 to 12 people probably have some or the other kind of a spinal condition. The trouble is, a lot of people aren't even aware that they have a bad back until they start to feel the pain, which is caused only when there is a pressure on the nerves. The spine provides a framework that houses the network of nerves that allow sensation and movement. Nerves branch away from the spinal cord and this means that pain felt in one place may actually be originating elsewhere-closer to the spine. So when you bend over to grab a folder from your file cabinet and feel a sudden shot of a sharp pain across your spine, you think it's the movement that might have caused the painful sensation, but in reality, bending down was just the straw that broke the camel's back; quite literally. "Such a condition is a result of, very often, years of ignoring warning signs that all is not well. 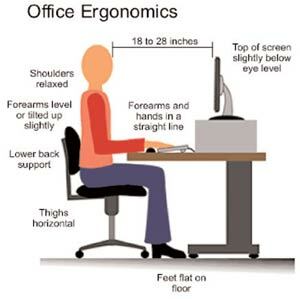 "Most times workplace desks are not ergonomically designed. A lot of us sit at our desks at work or in our car seats looking somewhat like this: the head is carried forward, the shoulders are rounded and hunched, the spine is bent. As a result, the neck, upper-and midback are tight and shoulder blades are pulled forward," says S P Sinha, Head of Physical Medicine, Peerless Hospital, Kolkata. Or if we do a lot of lifting as a part of our daily life, we don't squat; we curl the spine forward from the waist. Called in sick? A recent study by Bureau of Labor Statistics in the US has shown that about 1.1 million work days are missed in a year due to back related health conditions. Excess body fat around the midsection causes a forward pull of the lower back, putting more pressure on the spinal cord. Strengthen your abdominal muscles for a healthier back. For quick relief, a lot of people rely on balms and sprays. While rubbing the affected area can provide temporary relief, doing so can often aggravate the condition. Olive oil, salmon, sardines, nuts and seeds are rich in essential fatty acids, vitamins C, B, D, and K, and minerals like zinc and calcium, that help in bone and connective tissue repair of the spine. Avoid spring mattresses as they don't support the back. Never sleep on your stomach. Sleep on your side and place a pillow between your knees to reduce rotation of the lower back. Take a break. Avoid sustained postures for long hours at work. During periods of prolonged sitting or standing, stretch your legs and back, to avoid stiffness. "The way we sit, stand, walk, bend, sleep, move, or even don't move; coupled with age, genetics, work schedule, desk set-up, together create the pain and discomfort," says Dr H S Chhabra of Indian Spinal Injuries Centre, a super speciality hospital for issues relating to the spinal cord, located in South Delhi. "A sedentary lifestyle leads to weak back and abdominal muscles which may not properly support the spine. Prolonged usage of computer, or worse a laptop, leads to improper posture that puts stress on the muscles and ligaments," he says. Consider the Desk Jockey Syndrome (DJS), characterised by back and neck pain, as well as frequent shoulder pain and repetitive strain injuries; a common medical condition among corporates. Speaking of managing back pain while maintaining a normal life, Dr Chhabra says, "Management of back pain has two broad verticals: taking care of the pain and reducing the chances of its occurance. Pain can be managed with local application of heat/ice packs, antiinflammatory drugs, corsets, physiotherapy, or local injections. However these only provide temporary relief and aren't a long term cure. Aerobic physical conditioning (through walks, swimming, treadmill, stair climbing, cycling and other general conditioning exercises), patient education, and surgery are proven treatments which change the natural course of the disease." However, he adds, only up to three per cent of patients require surgery. For those suffering from back conditions, like degenerated disk or cervical spondylosis, functional restoration, as mentioned by Dr Katz, could help. This includes changes in the daily routine-from maintaining a certain posture while sitting or sleeping, to taking a two minute break after every half an hour. Such changes in the lifestyle, in time, can heal your back. Posture Perfect The above illustration shows an ideal sitting posture at work. Poor posture causes the natural arch of the vertebrae to be out of alignment, resulting in an inadequate support to the spine and causing pain.